Some weight loss authorities believe that our bodies use fat to dilute toxins. As an IR (infrared) Thermal System is an unsurpassed expeller of toxins, it is also a great way to get rid of any fat our bodies are using to dilute toxins we are storing. BEAUTY: Excellent for increasing blood circulation to the skin, which is essential for beautiful, youthful, glowing skin! A new "inner glow" as the skin is free of accumulated dirt and dry skin cells, due to deep cleansing of impurities! Help for acne, eczema, psoriasis, burns and any skin lesions or cuts. Open wounds heal quicker with reduced scarring. Removes roughness, leaving skin baby smooth and soft again. Firms and improves skin tone and elasticity. CELLULITE: Cellulite is a gel-like substance made up of fat, water, and wastes that are trapped in pockets below the skin. An Infrared Thermal System can assist this condition, as profuse sweating helps clear this form of unwanted debris from the body. European Beauty specialists confirm: a sauna will greatly speed any anti-cellulite program! Due to at least twice the depth of heat penetration into cellulite combined with up to 10 times the level of heating in these tissues an Infrared Thermal System can be significantly more effective than any conventional sauna. RELIEVE PAIN: Effective for arthritis, back pain, muscle spasms, headache, etc. INJURIES: Radiant heat helps with sprains, strains, arthritis, muscle spasm and pain. If you are an athlete, this IR Thermal System is all good news. It allows oxygen debt to be repaid more quickly. That's likely to lead to improved and quicker healing of sprains and muscle pain for you! The heaters in these IR Thermal Systems emit about one-third of their output in the middle infrared band, from 2 - 5.6 microns, for super-deep penetration and the other two-thirds in the long band, from 5.6 - 25 microns with that part of the output evenly spread around the 9.4 micron pivot point of peak human output. This distribution maximizes the higher penetration of the middle-band waves and combines them with the long waves that produce a resonant absorption amplification of healthy tissue output. The Chinese researchers consider the band from 2 - 25 microns as the most therapeutic. The source of infrared heat in these Thermal Systems is actually sand, warmed by an electrical resistance coil embedded within it. This is the same luxurious radiant heat we all enjoy while vacationing at the beach. The sand and coil are contained in a long, thin ceramic tube also tuned to our bodies. 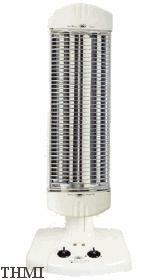 This zirconia ceramic emitting tube is shielded by a metallic grill that is covered by a soft coating of suede-tex, and is safe to touch while it is operating. Recent books such as 'Cross Currents', by Robert O. Becker, M.D., have detailed the hazards of exposure to certain kinds of electromagnetic fields such as those encountered under high tension power lines or while working at computer display terminals. Japanese researchers have reported that infrared radiant heat antidotes the negative effects of such toxic electromagnetic sources. These Thermal Systems have been tested and found to be free of such so-called "toxic" electromagnetic fields. The Swedish National Institute of Radiation Protection has concluded that the heaters in the Thermal System are not dangerous. It uses infrared radiant energy to directly penetrate the body's tissues to a depth of over 1 1/2". Its energy output is tuned to correspond so closely to the body's own radiant energy that our bodies absorb close to 93% of the infrared waves that reach our skin. A conventional sauna must rely only on indirect means of heat: First, on convection (air currents) and then, conduction (direct contact of hot air with the skin) to produce its heating effect on us. In an IR Thermal System, less than 20% of the infrared energy heats the air, leaving over 80% available to be directly converted to heat within our bodies. Thus an IR based system can warm its user(s) to a much greater depth and much more efficiently than a conventional sauna, as its energy output is primarily used to convert energy directly to heat in us and not to create excessively hot air that then only heats the skin superficially, this crucial difference explains many of the unprecedented benefits reported to be available through an Infrared Thermal System that are not attainable through the use of a conventional sauna. The infrared energy applied in these thermal systems may induce up to 2 - 3 times the sweat volume of a hot-air sauna while operating at a significantly cooler air temperature range of 110 to 130 degrees F. vs. 180 to 235 degrees F. for hot-air saunas. The lower heat range is safer for those concerned about cardiovascular risk factors that might be adverely affected by the higher temperatures encountered in old-style hot-air saunas. German researchers report beneficial effects from hour-long whole-body infrared exposure in two groups of hypertension patients that they studied in 1989 including a 24-hour long increase in peripheral blood flow and decreases in high blood pressure. It is also distinctly more pleasant to breathe air that is from 50 to 125 degrees F. cooler while saunaing. Due to its "user-friendly" nature, people naturally prefer to use the Thermal Systems and will continue to do so on a regular basis due to the ease of breathing much cooler air while feeling as warm as they choose, and to a distinctive feeling of well-being reported by users as an after effect. These Thermal Systems may even be used with the door fully open if the only effect desired is infrared penetration or if a very cool no-sweat experience is desired as in a pre-activity warm-up while fully clothed. This approach might be used in warming up prior to stretching, working out, running or exposure to cold weather. These IR systems are easier as well as more comfortable to use than old-fashioned hot-air saunas. Hot air saunas require extensive warm-up periods of 30 - 90 minutes, making them much less practical than the modern Infrared Thermal Systems which warm up in only 5 to 10 minutes from room temperature. Consistent and convenient at-home use is thus, again, much more likely with an IR Thermal System. Significantly lower operating costs make the Infrared Thermal System more desirable than a regular sauna. A 20-minute session, including a 10-minute warm-up in the Infrared Sauna, costs about 5 cents of electricity. A comparable session with a full warm-up in a conventional sauna costs about $.75 - $1.00. Daily usage of the Infrared Thermal System will raise your electrical bill by only $1.50 a month compared to $22.50 to $30.00 a month in a conventional sauna, if each is used for 20 minutes after warm-up. These Infrared Thermal Systems bring you the same infrared rays experienced in the traditional American Indian sweat lodge and bring them to you in a much more convenient and easily used form, in the privacy of your own home. The cleansing and purifying benefits attributed to the traditional sweat lodges are now available for daily purification without the time-consuming and extremely labor-intensive set-up process that a sweat lodge requires. Over the last 25 years, Japanese and Chinese researchers and clinicians have done extensive research on infrared treatments and report many provocative findings. In Japan there is an "Infrared Society," composed of medical doctors and physical therapists, to further research and support the health benefits of infrared as a method of healing. There have been 700,000 infrared thermal systems sold in the Orient for whole-body treatments, and an additional 30 million people have received localized infrared treatment in the Orient, Europe and Australia with lamps tuned to the same 2 - 25 micron wave band as employed in these whole-body Thermal Systems. Whole-body infrared therapy has been used for over 80 years by German physicians in an independently developed form. The Infrared Thermal System makes it possible for people in wheelchairs, or those who are otherwise unable to exert themselves or who won't follow through on an exercising and conditioning program to achieve a cardiovascular training effect. This also allows for more variety in any ongoing training program. "Many of us who run do so to place a demand on our cardiovascular system, not to build big leg muscles. Regular use of a sauna may impart a similar stress on the cardiovascular system, and its regular use may be as effective, as a means of cardiovascular conditioning and burning of calories, as regular exercise." As reported in the Journal of the American Medical Association, Aug. 7 1981. Due to the deep penetration, over 1 1/2 inches into the skin, of the infrared rays generated by these IR Thermal Systems, there is a heating effect deep in the muscular tissues and the internal organs. The body responds to this deep-heating effect via an hypothalamic-induced increase in both heart volume and rate. This beneficial heart stress leads to a sought-after cardiovascular training and conditioning effect. Medical research confirms the use of a sauna provides cardiovascular conditioning as the body works to cool itself and involves substantial increases in heart rate, cardiac output and metabolic rate. As a confirmation of the validity of this form of cardiovascular conditioning, extensive research by NASA in the early 1980's led to the conclusion that infrared stimulation of cardiovascular function would be the ideal way to maintain cardiovascular conditioning in American astronauts during long space flights. Blood flow during whole-body hyperthermia is reported to rise from a normal 5 - 7 quarts per minute to as much as 13 quarts per minute. "The 1980's was the decade of high-impact aerobics classes and high-mileage training. Yet there was something elitist about the way exercise was prescribed: only strenuous workouts would do, you had to raise your heart rate to between X and Y, the only way to go was to 'go for the burn.' And such strictures insured that most 'real' exercisers were relatively young and in good shape to begin with. Many, many Americans got caught up in the fitness boom, but probably just as many fell by the wayside. As we've reported, recent research shows that you don't have to run marathons to become fit - that burning just 1,000 calories a week... is enough. Anything goes, as long as it burns these calories." Reported in the Wellness Letter, Oct. 1990, from the University of California Berkeley. In Guyton's Textbook of Medical Physiology, we find that producing one gram of sweat requires 0.586 kcal. The JAMA citation referred to above goes on to state that, "A moderately conditioned person can easily sweat off 500 gm. in a sauna, consuming nearly 300 kcal -- the equivalent of running 2-3 miles. A heat-conditioned person can easily sweat off 600 - 800 ckal with no adverse effects. While the weight of the water loss can be regained by re-hydration with water, the calories consumed will not be." Since an IR Thermal System helps generate two to three times the sweat produced in a hot-air sauna, the implications for increased caloric consumption are quite impressive. Assuming "a sauna" as mentioned in JAMA, to last for 30 minutes, some interesting comparisons may be drawn. Two of the highest calorie output forms of exercise are rowing and marathon running. Peak output on a rowing machine or during a marathon run burns about 600 calories in 30 minutes. An Infrared Thermal System may better this effect from "just slightly" to up to 250%, by burning some 900 to 2400 calories in a 30-minute session. The Infrared Thermal System might then simulate the consumption of energy equal to that expended in a 6 - 9 mile run during only a single session. An Infrared Thermal System can, thus, play a pivotal role in both weight control and cardiovascular conditioning. this would be easily valuable for those who don't exercise and those who can't exercise yet want an effective weight control and fitness maintenance program and the benefits that regular exercise can contribute to such a program. Compression Fracture - Example: pain stopped for 3 days with single treatment. "Medical practitioners make use of Infrared Radiant heat to treat sprains, strains, bursitis, peripheral vascular diseases, arthritis, and muscle pain..." according to the McGraw Hill Encyclopedia of Science and Technology. A case study was reported in Sweden of a 70-year-old man with Rheumatoid Arthritis secondary to acute rheumatic fever. He had reached his toxic limit on Gold injections and his Erythrocyte Sedimentation Rate was still 125. Within 5 months of use of an Infrared Thermal System, his ERS was down to only 11. In a case of Rheumatic Arthritis in a 14-year-old, Swedish girl who couldn't walk comfortably downstairs due to knee pain since she had been eight-years old, her rheumatologists told her mother that her child would be in a wheelchair within 2 years if she refused gold corticosteroid therapy. However, after 3 infrared sauna treatments she began to become more agile and subsequently took up folk dancing without the aid of the conventional approach in her recovery. A clinical trial in Japan reported the successful solution of seven out of seven cases of Rheumatoid Arthritis treated with whole-body infrared therapy. These case studies and the clinical trial indicate that further study is warranted on the use of whole-body infrared therapy in the care of patients with Rheumatoid Arthritis. The following is summarized from 'Therapeutic Heat and Cold,' 4th edition, ED. Justus F. Lehmann M.D., Willians and Wilkins, chapter 9 or concluded from the data therein. 1. It increases the extensibility of collagen tissues. Tissues heated to 45 deg. C and then stretched exhibit a non-elastic residual elongation of about 0.5 - 0.9% that persists after the stretch is removed which does not occur in these same tissues when stretched at normal tissue temperatures. Thus 20 stretching sessions can produce a 10 - 18 percent increase in length in tissues so heated and stretched. Such stretching at 45 degrees C. caused much less weakening in stretched tissues for a given elongation than a similar elongation produced at normal tissue temperatures. The experiments cited clearly showed that low-force stretching can produce significant residual elongation when heat is applied together with stretching or range-of-motion exercise, which is also safer than stretching tissues at normal tissue temperatures. 2) It decreases joint stiffness directly. There was a 20% decrease in stiffness at 45 degrees C. as compared with 33 degrees C. in rheumatoid finger joints, which correlated perfectly to both subjective and objective observation of stiffness. 3) It relieves muscle spasms. High Blood Pressure - safe in 40 - 50 degree C. range and regular use helps to lower it. Auto Accident-related Soft Tissue Injury - daily sessions were used until best healing was attained; then the Thermal Systems were used to deal with permanent residuals. The pain control effect on the chronic residuals from such injuries lasted three days before another treatment was necessary. Menopause Symptoms - relieved chills, nervousness, depression, dizziness, head and stomach aches. Weight Loss - first, through sweating and the energy use needed to produce the sweat and second, through direct excretion of fat. Arthritis	Sciatica	Backaches Hemorrhoids	Nervous Tension	Diabetes Children's Over-tired Muscles	Varicose Veins	Neuritis Bursitis	Rheumatism	Strained Muscles Fatigue	Stretch Marks	Menstrual Cramps Upset Stomachs Leg and Decubitus Ulcers - that fail to heal using conventional approaches. Peripheral Occlusive Disease - "The goal is to maintain an optimal blood flow rate to the affected part... In general the temperature should be maintained at the highest level which does not increase the circulatory discrepancy as shown by cyanosis and pain." Therapeutic Heat and Cold, pp. 456-7. Finnish researchers, talking about the regular use of conventional saunas state that "there is abundant evidence to suggest that blood vessels of regular sauna-goers remain elastic and pliable longer due to the regular dilation and contraction" of blood vessels induced by sauna use. German medical researchers reported in "Dermatol Monatsscher" in 1989 that a single whole-body session of infrared-induced hyperthermia lasting over one hour had only beneficial effects on subjects with stage I-II essential hypertension. Each subject experienced a rise in core body temperature to maximum level of 38.5 deg C. All of the subjects in one experiment had significant decreases in arterial, venous and mean blood pressure that lasted for at least 24 hours and was linked, according to the researchers, to a persistent peripheral dilation effect. This result is possibly produced by the combined effect of heat on both primary and secondary afferents from spindle cells and from its effects on Golgi tendon organs. The effects produced by each of these mechanisms demonstrated their peak effects within the therapeutic temperature range obtainable with radiant heat. 4) It produces pain relief. Pain may be relieved via the reduction of attendant or secondary muscle spasms. Pain is also at times related to ischemia due to tension or spasm which can be improved by the hyperemia that heat-induced vasodilation produces, thus breaking the feedback loop, in which the ischemia leads to further spasm and then more pain. Heat may both lead to increased endorphin production and a shutting down of the so-called "spinal gate" of Melzack and Wall, each of which can reduce pain. 5) It increases blood flow. Heating of one area of the body produces reflex-modulated vasodilation in distant-body areas, even in the absence of a change in core body temperature; ie., heat one extremity and the contralateral extremity also dilates; heat a forearm and both lower extremities dilate; heat the front of the trunk and the hand dilates. Temperature elevation produces an increase in blood flow and dilation directly in capillaries, arterioles and venules, probably through direct action on their smooth muscles. The release of bradykinin, released as a consequence of sweat-gland activity, also produces increased blood flow and vasodilation. Whole-body hyperthermia, with a consequent core temperature elevation, further induces vasodilation via a hypothalmic-induced decrease in sympathetic tone on the arteriovenous anastomoses. Vasodilation is also produced by axonal reflexes and by reflexes that change vasomotor balance. 6) It assists in resolution of inflammatory infiltrates, edema and exudates. The increased peripheral circulation provides the transport needed to help evacuate the edema that can help end inflammation, decrease pain, and help speed healing. 7) More recently, it has been used in cancer therapy. This is a new and experimental procedure. It shows great promise in some cases when used properly. American researchers favor careful monitoring of the tumor temperature; whereas, the successes reported in Japan make no mention of such precaution. There have been over 7,000 IR Thermal Systems sold in America, and infrared healing is now becoming the leading edge in the care of soft tissue injuries to promote both relief in chronic or intractable "permanent" cases, and accelerated healing in newer injuries. Localized infrared therapy using lamps tuned to 2 - 25 micron waveband is used for the treatment and relief of pain by over 40 reputable Chinese Medical Institutes. An improvement in plasma viscosity was also noted. Another group of similar hypertensive patients was also studied under the same conditions of infrared-induced hyperthermia, with an eye toward more carefully evaluating the circulatory system effects induced by this type of whole-body heating. During each infrared session there was a significant decrease of blood pressure, cardiac ejection resistance, and total peripheral resistance in every subject. There was also a significant increase during each session of the subject's heart rates, stroke volumes, cardiac outputs and ejection fractions. The researchers site these last three effects as evidence that the simulation of the heart during infrared-induced hyperthermia is well compensated, while the prior list of effects show in clear detail the microcirculatory changes that lead to the desired result of a lowering of blood pressure. Cold hands and feet - A physical therapist found 20% - 50% improvement was maintained. High Blood Pressure - Example: Case of a diabetic with a systolic decrease from 180 to 125 and a concurrent 10 lbs. weight loss after infrared use. Rheumatoid Arthritis - 7 out of 7 cases successfully resolved in one clinical trial. Radiation Sickness - relieves signs and symptoms. Cancer Pain - relieved pain in later stages of cancer extremely well. Sequelae of Strokes - Example: Hemiparesis relieved over time. Pain - which prevented sleep or limited useable sleep positions was relieved. Compression Fracture Pain - Example: pain gone in 3 days after each treatment in osteoporotic compression fractures. Cirrhosis of Liver - reversed. Asthma, Bronchitis - cleared up (like moving to Arizona's dry air). Post Surgical Adhesions - reduced. Leg Ulcers - healed when previously static and resistant to other care. Keloids - significantly softened and, in some cases, completely gone. Chronic middle-ear inflammation or infection - In one clinical study of chronic serous otitis media no pathogenic bacteria were isolated in 70% of the subjects studied. Clogged pores are unplugged of cosmetics creating a skin texture and tone of unexcelled quality. Mikkel Aaland's book 'Sweat' (Capra Press, 1978) quotes a Finnish doctor to the effect that: "The best dressed foreigner can come into a doctor's office, and when his skin is examined, it is found to be rough as bark. On the other hand, as a result of the sauna, the skin of any Finnish worker is supple and healthy." Poor skin tone is restored to a more youthful level. Scars and pain from burns or wounds are decreased in severity and extent. Infrared therapy is used routinely in burn units throughout Asia. Lacerations heal quicker and with less pain and scarring. Acne - Three or four Infrared treatments may open pores that have not been functioning in years, forcing out clogging cosmetics and loosening dead outer skin. The sauna is thus a boon to teenage skin, clearing acne and blackheads. Body odor - by improving the function of the skin, the Thermal System sauna may eliminate the cause of offensive body odor. It definitely reduces body odor induced by occupational exposure to odorous chemicals. Eczema and Psoriasis - have reportedly responded extremely well to Infrared treatments. Sunburn - According to the Ninth Edition of Clayton's Electrotherapy, "Infrared radiation is the only antidote to excessive ultraviolet radiation." Keloids form at a reduced rate in those prone to there formations with IR Thermal use and may be softened by use of IR Thermal Systems if they have formed.